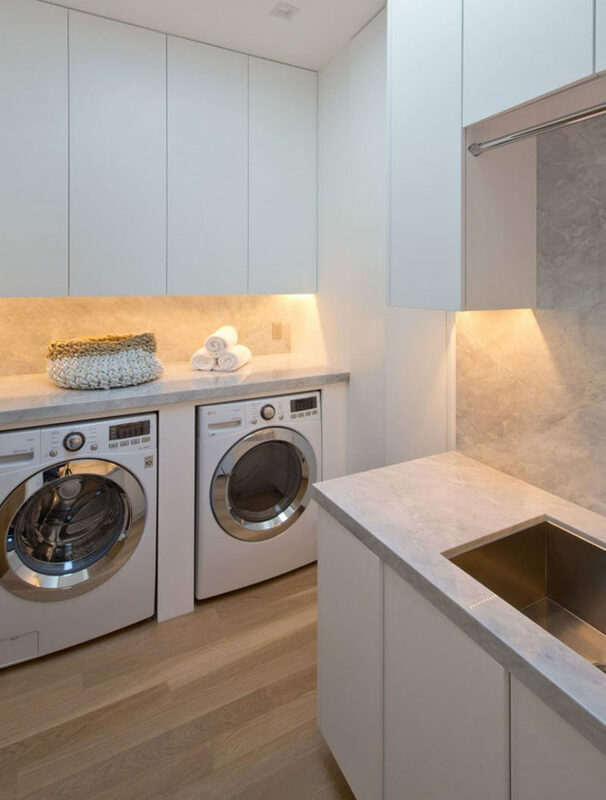 The laundry room is a spot in the house that’s easy to overlook. 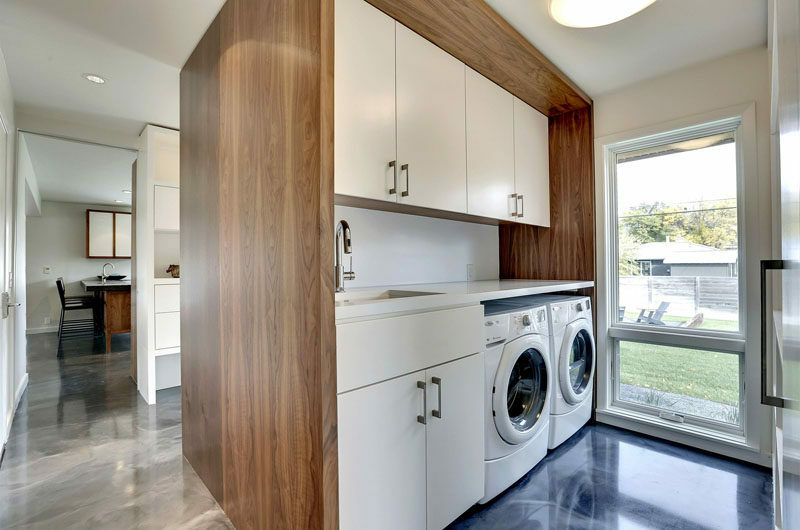 Nobody really loves doing laundry, so putting effort and money into making the laundry room a nice place seems unnecessary to many. However, turning your laundry room into a place you feel comfortable and relaxed can make the job a whole lot more enjoyable. 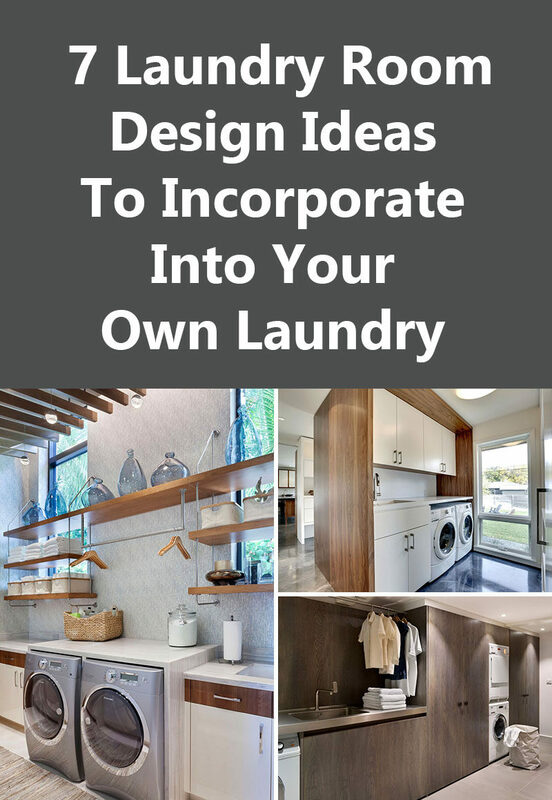 We’ve put together 7 design ideas that you can include in your laundry room to make it more appealing and the task of washing clothes feel a little less chore-like. Drip drying your clothes is a great way to save energy but can be hard to do if you don’t have the proper set up for it. Installing a hanging bar makes it easy to hang up your dryer sensitive clothing. It also creates a convenient spot to store any extra hangers you may have tucked in closets throughout the house in one easy to find place. 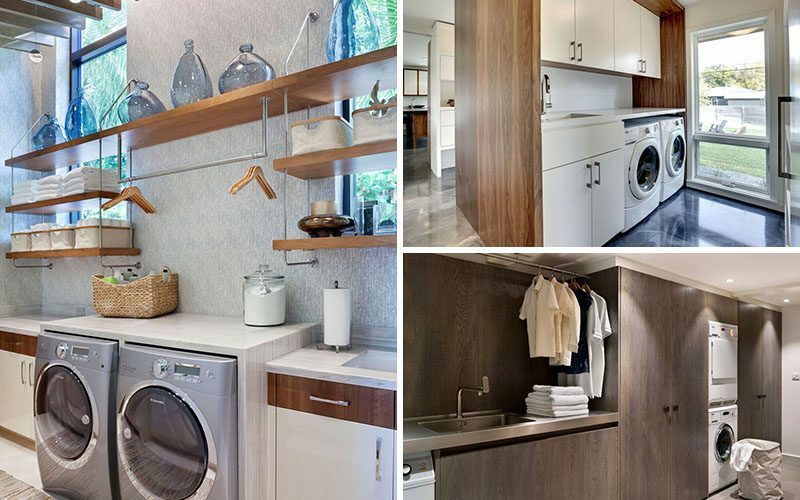 Inspiration from a laundry room in a house built by Mark Timothy, Inc with interiors by Marc Michael’s Interior Design and cabinetry by Superior Wood Products. Cabinets are great, except for when you have to open each and every one of them to find the thing you’re looking for. Open shelving keeps everything in plain sight and makes it super easy to grab exactly what you’re looking for when you want it. 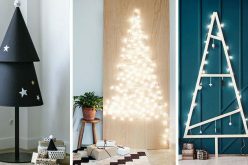 It also creates an opportunity to display things in a more beautiful way and turns everyday items into laundry room decor. 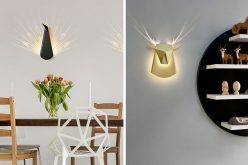 Inspiration from Alex Findlater Ltd. 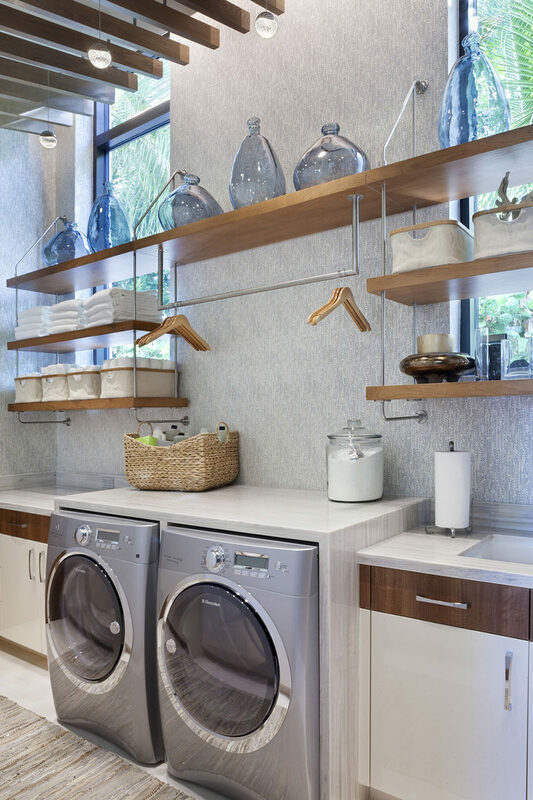 Surrounding your appliances with a custom unit makes the laundry room look a whole lot more put together. 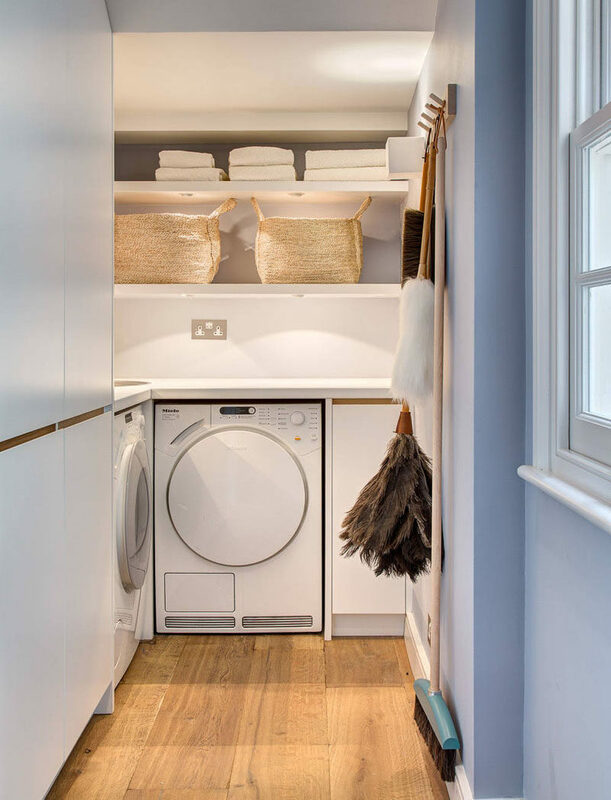 It creates a space that’s easy to clean and makes piling and sorting your laundry an easier task as you go through it. 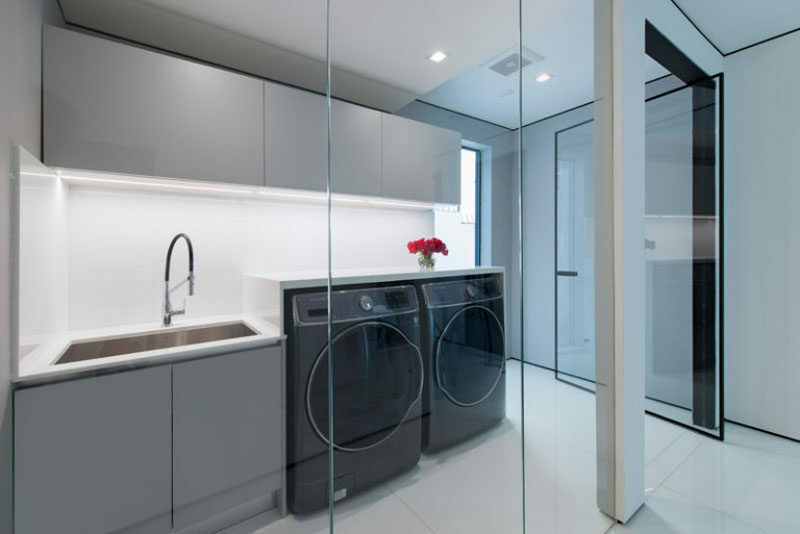 A custom designed unit surrounding your washer and dryer also ensures that no socks or other clothing items get lost behind the appliances forever. See more photos of this house, here. 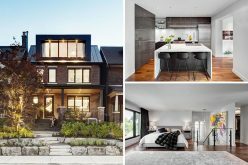 Originally designed by Gregory Ain, renovation completed by Core Development Group. Photography by Bill Singleton. Using baskets to organize your things is a good idea in any room. In the laundry room it makes extra sense because there are so many different things stored in there. Having a basket designated for cleaning supplies, another for clean towels, and another for random bits and bobs makes the room look more organized and makes it easier to find what you’re looking for. Inspiration from Detail 9 Architects. Photography by Precon Living. Doing laundry requires spending a good chunk of time in the laundry room, sorting, folding, and transferring clothes from one machine to the next. 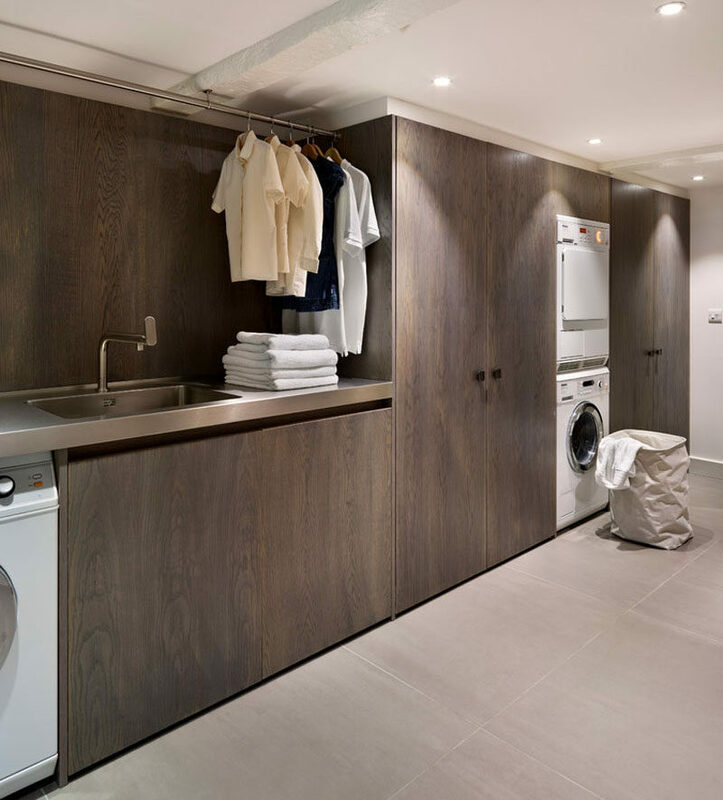 The last thing you want in your laundry room is to feel overwhelmed by the colors and materials you’ve got in there. 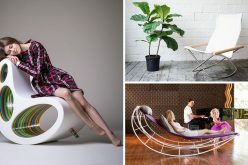 A neutral color palette with natural materials like wood helps keep the space feeling calm and relaxing, even when you’ve got a to do list that’s anything but relaxing. 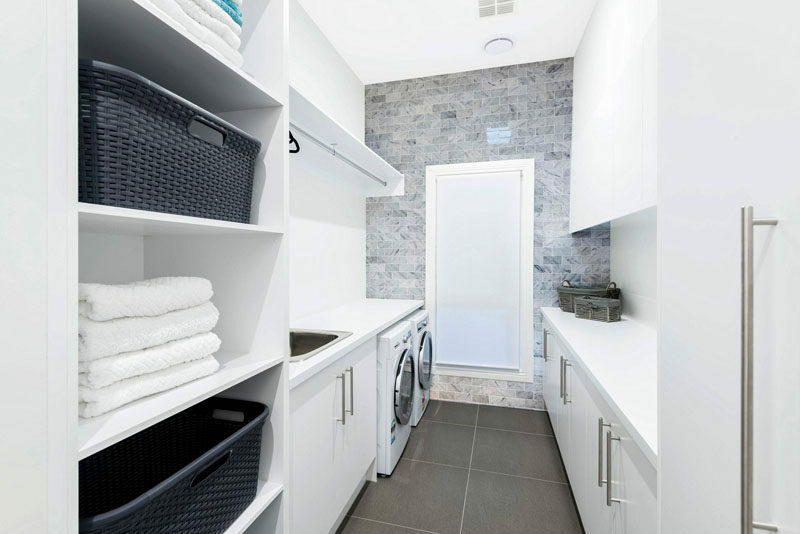 Creating a laundry room that’s got everything you need in it makes it easier to confine the job to just one spot. 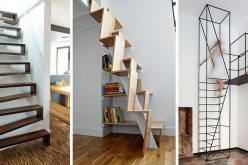 Rather than spreading the job out over multiple rooms, sorting in one, doing the laundry in another, and folding in the living room, keep the job in one spot to contain it and prevent it from taking over everything. Adding a separate counter space for sorting or folding laundry helps achieve this and makes it easy for people to pick up their laundry from organized piles on the countertop. 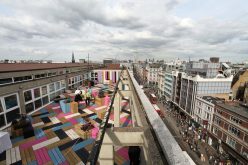 Inspiration from Marsden Building & Remodeling. Sometimes laundry needs a little extra soaking time to get out a tough stain. Make sure you don’t have to commandeer the kitchen sink to soak your clothes by including a sink in the design of your laundry room. The sink, while being a great spot to soak clothes, sheets, towels, and other things, also becomes a perfect spot for washing small pets and cleaning extra dirty things that you don’t necessarily want in your everyday kitchen sink.